Please read our FAQ carefully and if you got any questions contact us at hello@sharolta.com. We try to source all our materials second hand (waste material of factories, used clothing) however sometimes we need to add accessories made of new materials (such as padding, zip, etc) when no recycled option is available. On each product’s description the composition of the used materials are clearly indicated. Our products are made of upcycled materials, therefore your product might not be exactly the same as it shown on the photo on the website. There might be slight variations due to the materials available. It means that for example the picture shows a dress from light and dark denim patches, your product will have the same colour variations on the same patches (light and dark denim) but it might not be exactly the same colour, but very similar. Our products are hand made in Hungary, Europe. We ship worldwide, orders shipped from Hungary. Items will be shipped in 5 business days after purchase. You will receive a notification email when your order was shipped. Currently we work with standard shipping only which is a service provided by the Post. However we are working hard to make express shipping available to our customers very soon. Thank you for your understanding. **Shipping time to European countries usually takes 3-5 days except for Norway where it is indicated as 3-8 days. Do I need to sign up for an account to shop at sharolta.com? What happens when I placed an order? You will receive an automatic notification email of your order. If you don’t receive our notification email, please check your spam folder in your mailbox. In case you still don’t find our email please write us an email because probably the given email address was incorrect. How do I know that my order was shipped? We will send you a shipping notification email. We will provide you with the tracking number in the email. I didn’t receive my order. What to do now? Please only write us when 30 days are gone from your shipping notification date. We will resend it. With express shipping you have to receive your order 1-4 days after than your shipping notification email was sent. Please call FedEx with the tracking number we provide. 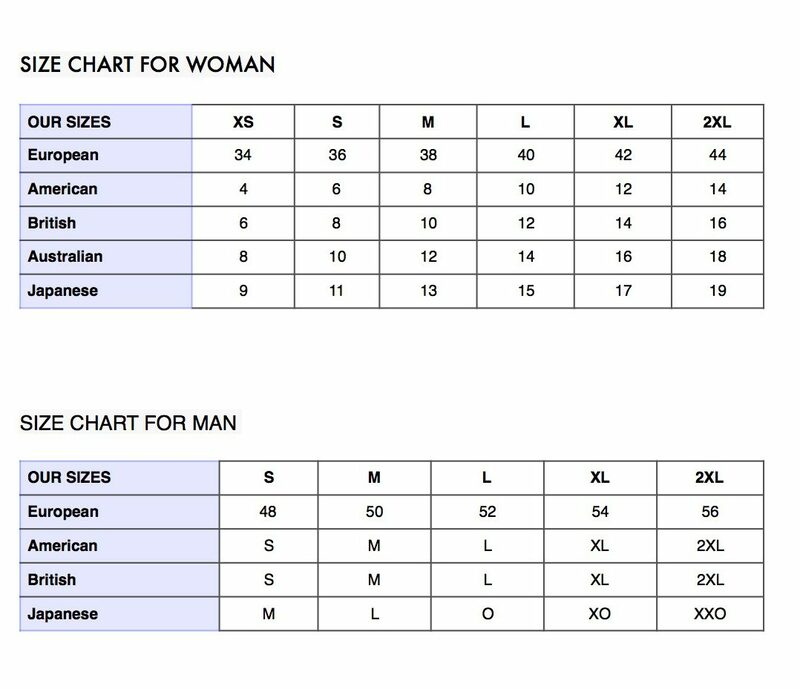 Our size chart helps you find the right size. You only need to know your size in your country. If you are in between two sizes or close to the upper limits of a size we recommend choosing the bigger size. Can I replace the product if the size does not fit or ask for a refund? If the items are not worn, you have 30 days from the purchase to replace or send them back. To be eligible for a return, your item must be returned in the manner in which they were received: folded properly, unworn, clean with original tags attached and it must also be in the original packaging. Sorry, we can’t accept returns for any items that show signs of being worn. Before sending a product back be sure to read our refund policy and please connect us. Replacement or refund does not apply to gift cards and products on sale! We refund your original shipping cost, but you will be responsible for paying for your own shipping costs for returning your item. If you return products you should consider using a trackable shipping service or purchasing shipping insurance. We don’t guarantee that we will receive your returned item and we cannot be held liable for any lost items in the post. To complete your return, you must email hello@sharolta.com with the subject line “Return Request” to receive a Return Number. Once your return is received, we will send you an email to notify you that we have received your returned item. We will also notify you of the approval of your refund. If you are approved, then your refund will be processed, and a credit will automatically be applied to your credit card or original method of payment, within 5 days.